I don’t really get excited when I read that the movie I’m going to watch is a “coming of age” comedy. It makes me think of films that pretend not to be exactly what they are and fail on either front as far as this reviewer is concerned. But Dope isn’t those movies so I can’t throw it in there with all those other “Life is crazy when you’re growing up!” emotional manipulators. Malcolm likes to hang out with his friends, play in their band, and engage in some pretty nerdy hobbies. But he also wants to get into Harvard and is being shot down at every turn. And when a local gang switches his backpack with theirs, things take a turn for the insane as Malcolm has to figure out how to get out of the situation while still keeping his mind and his life intact. The most fun of the movie are the interactions. 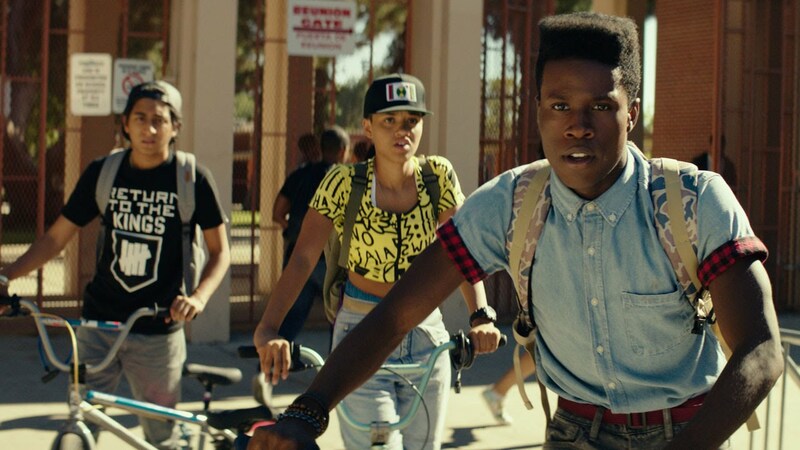 Lead Shameik Moore really does come off like the awkward nerd he’s supposed to be and sells it every scene. Which is good because he’s in every scene. From his flat top to his “MC Hammer pants” I’m wondering where the inspiration for his character came; not just interested in 90s culture, but almost acting it out every day. Pretty funny that while Malcolm gets made fun of for dressing the way he does, his environment in many aspects, is just as stunted as Malcolm’s style. Gang violence and drug busts are an everyday thing and it’s what’s driving Malcolm to escape and go onto Heaven-on-earth, Harvard. The music is another huge help in this movie, giving it its own unique feel. With original songs by Pharrell Williams (Never thought of that as a positive thing personally), I couldn’t help but think when I was watching it that this was going to be a cult classic. 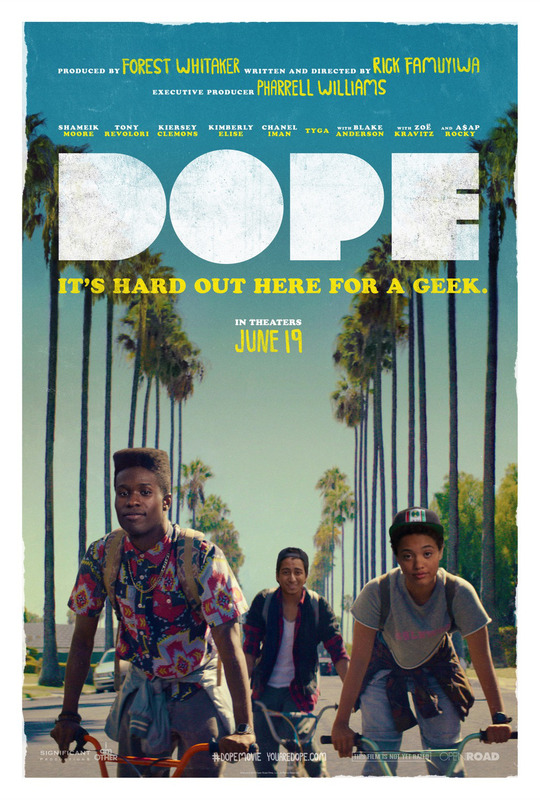 I don’t see Dope as a sort of little brother to Boyz in the Hood or something, winning acclaim and awards (Make a movie great, these things do not) but people who watch this movie are just going to like it. One thing I’m happy to say about it is that something is always happening. The few slow moments are there more to make us feel like we’re taking a breath before we get back to the rest of Malcolm’s life where something is happening nonstop. So there’s no time for feel lag because for the hour and forty minutes we’re watching, everything feels interesting. I don’t think anybody should be getting their morals from films but I’ll throw this in anyway. The one feature of the film that sort of threw me off was the overall message. I’m not going to get into any spoilers (if there could even be any for this movie) but it felt a little mixed up. Malcolm’s life is one of carefully avoiding the drug related violence around him while his own journey involved going straight through all of it and to come out on the other side okay. The film, and maybe I missed something, seems to be okay with Malcolm taking part aspects of the gang lifestyle as long as he didn’t begin to live that way himself. If you’ll notice, image A and image B are nearly identical. Like I said, I might have missed something so if somebody wants to fill me in, that would be great. Other than that, great movie. Positives: Music, acting, pacing, everything fits nicely into a decent run time. Malcolm’s hair is funny every time you see it. The leads nicely cast especially. Negatives: Mixed message, at times it can feel like a “wacky” comedy, the presentation is one that won’t speak to many people. This entry was posted on 06/19/2015 at 11:29 am and is filed under Reviews! with tags Dope, movie review. You can follow any responses to this entry through the RSS 2.0 feed. You can leave a response, or trackback from your own site. I gotta see this. I’ve been so behind on my movie watching. I still haven’t even seen American Sniper. And I’m way behind on Supernatural. Eh, American Sniper can be skipped personally unless you’re all about Bradley Cooper. But Dope is a must. And Mad Max. That being said, I’m fairly confident that the point of it’s message is conveyed concisely by the narration sequence towards the end. The fact that the protagonist didn’t have a choice in regards to the path he had to trek, this speaks from the heart to many who grow up in such neighborhoods. This film’s plot serves as a perhaps allegoric nod of encouragement for those who grow within underprivileged circumstances. Situations where people are either forced to figure things out for themselves & transcend reaching new[for their MEMEs] higher ground or become consumed by the prolific and destructive cultures cultivated by their immediate habitats. Yeah I’ve had time to think about it since and I’ve got a little better of a handle on it. Still, nothing beats that haircut.